Our time in Annapolis is coming to a close. Matt, his sister and the boys go up to Ithaca, NY for their mom’s birthday over the July 4th weekend. I crash in Baltimore at his sister’s place – glued to my computer working on research papers and enjoying AC and modern conveniences. When they get back, I do last-minute errands with the boys. Joshua received a penknife for Brother’s Day and Malachi has been coveting it. I figure if the 6-year-old can handle it, so can the 8-year old. 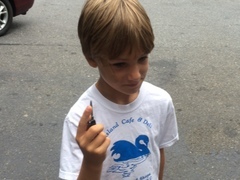 We get to the car and literally 90 seconds after opening it, Malachi stabs himself in the face with it – only 1 mm from his eye. He had the blade open and, simultaneously, reached down to pick up some trash on the floor of the van. As a parent, I want to absolutely freak out. But it’s me. And all I can do is recall the day I was prepping dinner and reached up to itch my face while holding a 10-inch knife – almost stabbing out my own eye. It is damn scary to see yourself reflected back at you in your children. Anyway, both of them borrowed money from the Bank of Mom and need to repay me. We head to the bank so they can withdraw money (and yes, we could have transferred everything electronically but I want them to experience it). The teller hands me two withdrawal slips and I have the boys fill out their names and the amounts while I fill in the rest. I hand the slips to the teller. He hands them back and says “I need their signatures.” I glance down at my 6- and 8-year-old. Signatures? Hell, they can barely write their names. We just had a discussion about signatures and what they are used for the day before. Joshua had his own ideas about them. 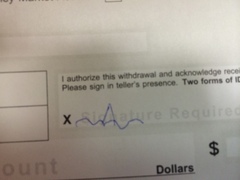 I look at the teller, “Are there any constraints on the signature?” He looks at me puzzled. I rephrase the question, “Can they be anything?” “Sure …” he answers slowly. This is Joshua’s signature (if you can’t tell, it’s a shark fin in the water); Malachi’s is a sailboat in water. To the teller’s credit, he smiles and processes the transactions. 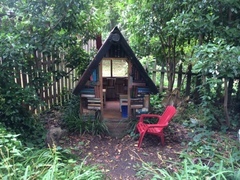 Decrepit books at a used bookstore, shellacked to create a bookhouse in its garden. A bibliophile’s dream. This entry was posted in Uncategorized on July 21, 2014 by Diane.